“In my senior year of college, a fraternity brother passed away from amyotrophic lateral sclerosis (ALS), a progressive neurodegenerative disease. I remember vividly the sense of powerlessness felt by everyone involved, and it inspired me to commit my future to research—where I would always have the power to do something in the face of a problem. My research first took shape as a first-year Ph.D. student, when I stumbled on a potential novel receptor in the central nervous system that appeared to be involved with failed nerve regeneration. Right after graduation in 2013, I started Novoron Bioscience to develop drugs designed to target this receptor and restore the natural healing of damaged nerves. Novoron believes these therapies can promote regeneration of the brain and spinal cord, and reverse the devastating consequences of nerve damage, such as paralysis. Since our move to JLABS, we started a second program focused on Multiple Sclerosis. It’s aimed at restoring myelin—the protective coating around the nerve—to help reverse nerve damage and paralysis in the disease. 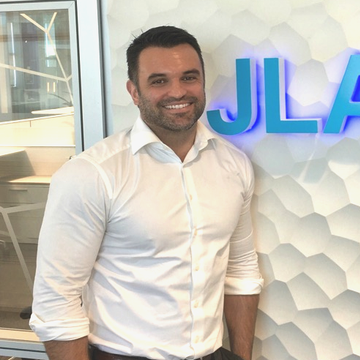 In October 2014, we went from incubating at a small biotech company to joining the San Diego branch of Johnson & Johnson Innovation, JLABS, an incubator division of the company. Best decision ever. The charitable spirit of the staff has been amazing. They have gone out of their way to foster our success, from making introductions to providing mentorship opportunities. Our close proximity to other companies is also invaluable—I rely on the expertise of people at different companies here. You never feel like you have to be secretive. Since our move to JLABS, we started a second main program focused on Multiple Sclerosis (MS), with funding from a National Institutes of Health (NIH) grant. It’s aimed at restoring myelin—the protective coating around the nerve—to help reverse nerve damage and paralysis in the disease.